"Grab Your Free Copy of ACAD LT."
There is no wonder why people are looking to download free AutoCAD LT. This is a great CAD software program, for 2D drafting applications, that is a fraction of the cost of the full blown AutoCAD version. Ah... I hear asking, "A fraction of the cost, I thought it was supposed to be free?" Well, it is initially; that is, it is no cost to evaluate the software for 30 days. It is worth the wait to download this free CAD lite software program. After all, it is the number one 2-Dimensional drafting product on the market in terms of sales volume. With ACAD LT, you will also be using an industry standard drawing file format, known as DWG. If you are a small company or freelance CAD drafter, you may find it easier to interchange files with other companies and firms in the Architectural, Engineering and Construction industries. Often many AEC firms use Autodesk products. This makes sharing information between you and your client seamless. Many of the features in the full version of AutoCAD are already included in AutoCAD LT. In fact the major differences between the two software platforms aren't really that noticeable to novice users. Full blown AutoCAD can be fully customized by users who employ certain programming skills, as it supports the integration of different programming languages whereas the liter version does not. Additionally, the 3D capabilities are far more advanced in regular AutoCAD, compared to AutoCAD LT.
Click here to download the 30 day evaluation free AutoCAD LT program. But again, unless you really need these extra features, there is no real requirement for AutoCAD, as AutoCAD LT will be adequate for many. 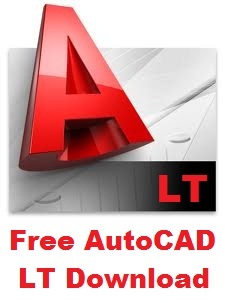 To get your AutoCAD LT free download, you will have to visit the Autodesk website. Just fill out the on-line form and you'll be good to go. Remember, after 30 days you will need to purchase a license to continue using this drafting software. You may also be interested in visiting an auction site to pick an AutoCAD LT program at a good price.